Fuuuuuuuu! What did I just watch? Is this it? Is this the big breakdown? Not quite. This is just Dropsy, a mute clown with no hands, a horrific smile, and a burning (and, apparently, entirely innocent) desire to hug everyone he meets. It's been a while since we last heard from the cheese dream clown. His game was successfully Kickstarted in late 2013 to the tune of $25,000, and we took a bit of a closer look at it shortly thereafter in an interview with creator Jay Tholen, in which he said, "Loving the unlovable is one of the game's most prominent themes." Things have been fairly quiet on the Dropsy front since then, but today, publisher Devolver Digital announced that Dropsy will bring his "non-traditional take on the classic point and click adventure formula" to Steam and elsewhere on September 10. 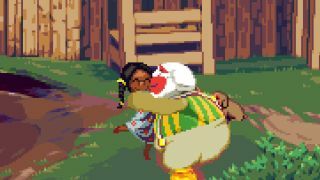 Rather than following a conventionally linear narrative, Dropsy's story takes place in an open world, allowing players to explore and take on the plot and puzzles however they choose, as they lead the clown on a quest to clear his name after a deadly circus fire. "Dropsy takes players on a self-aware journey of self-discovery with a story that harnesses powerful themes of love and redemption—Dropsy the character is an outsider, longing for a community to call his own," Devolver wrote in the launch date announcement. "Along his adventure, players will find answers to geographically based puzzles, unravel dark and shameful secrets from his past, and collect fancy items to stuff in his elastic waistband for use along the way." Capping it all off is this trailer, which is almost unspeakably bizarre but also really makes me want to play this thing. I guess that means it's good? It's sure something, anyway. I don't think I can articulate it any better than that. Hugs!